A little sweet and a little heat, this couldn’t-be-easier raspberry chipotle sauce brings another dimension to Thai-spiced scallops (above), broiled fish fillets, chicken, pork, wild game and grilled vegetables. The past two years, we’ve been able to pick a surfeit of big, beautiful raspberries from a patch gone ferrel a half-mile from our home here on Chignik Lake. Barbra takes this fruit and turns out tangy freezer jam as well as traditional jam. The jams in turn go into airy raspberry mousse, raspberry almond tarts, mixed with our steel cut oats for breakfast, stirred into our homemade yogurt, drizzled onto lemon bars and cheesecakes, and spread on our peanut butter sandwiches. We even add a touch of raspberry to one of our favorite cocktails, Raspberry Bourbon Berets. One of my favorite ways to use our jam is in raspberry chipotle sauce. It’s quick, it’s easy, it keeps well in the fridge, and it’s absolutely terrific on fish, pork and poultry. The directions couldn’t be easier, and your favorite store-bought raspberry jam will probably work fine. Try this on salmon fillets. Mix together 1/2 cup raspberry jam, 1/2 tablespoon balsamic vinegar, and 1/2 teaspoon powdered chipotle pepper. Alternatively, you can substitute a favorite powdered chile blend, but choose one with a good amount of chipotle as the smokey flavor really compliments fish, meat and poultry. Close to the bone, salmon meat near the skeleton is lean and tasty. Salmon spines (salmon carcasses with some meat still attached) are perfect candidates for the broiler. Add some vegetables to the broiling pan and you’ve got a gourmet meal for two. No sooner did we return back home in Chignik Lake than we began turning our attention to filling our freezer and smoker with salmon. Wild salmon are precious, and every last bit of salmon meat is delicious. I don’t always get the fillets off the bones as cleanly as I’d like. That’s where this dish comes in. While the photos depict a Sockeye salmon, other species work well, too, and of course a fillet works as well as a spine in this recipe. 1. Position your oven rack to the second level below the broiler. Place a broiling pan on the rack and turn on the broiler to preheat the pan and the oven. 2. Chop up some of your favorite vegetables. Pick ones that are hardy enough to withstand a few minutes under the broiler. Whole garlic cloves roast up soft, slightly charred and delicious in this recipe. Fruit such as pitted olives work well, too. 3. To serve two, measure out about two cups of Farfalle pasta. Other types of pasta are fine. Mise en place: whole garlic cloves, bell peppers, Brussels sprouts, fresh oregano, sea salt, pasta and Kalamata olives. You’ll also need a good extra virgin olive oil, a broiling pan, and, of course, the salmon spine or fillet. 4. Toss the vegetables together in a bowl along with sea salt and olive oil. Fresh or dried thyme or oregano are good herb choices. Sprinkle salt into the vegetables to taste, add a couple of tablespoons of olive oil, then mix together. As an additional option, a tablespoon or so of mirin – a light, sweet cooking wine – adds a hint of sweetness and helps the vegetables brown and char. 5. Next, rinse the salmon in cold water and dry and clean it with paper towels. There may be some dark matter running along the spine inside the skeletal cavity. That’s the kidney. If there’s a lot of this, you can use a knife or even a spoon to scrape it out. It can be further cleaned up with a stiff brush. A toothbrush works well for this. 6. Place the salmon spine on a cutting board and give it a fairly generous sprinkling of salt. A good sea salt (we like gray sea salt) really brings out the flavor of salmon. 7. Take the preheated broiling pan out of the oven. Use a brush or spatula to coat the surface with olive oil. Arrange the salmon and the vegetables on the pan. It should be sizzling hot. Place the pan back into the oven and broil for about 8 or 9 minutes. 8. While the salmon is broiling, prepare the pasta according to the maker’s directions. Colored bell peppers and Brussels sprouts char and caramelize beautifully under a broiler. 9. After about 8 or 9 minutes, remove the broiling pan from the oven. Transfer the salmon to a cutting board and use a fork to pull the meat off the bones. You want chunks of a good size to go on a fork along with a bite of vegetable and a bit of pasta. 10. Finally, plate up the pasta. Add the salmon and vegetables. Finish with freshly grated Parmesan cheese and a couple of grinds of freshly cracked pepper. Serve hot with a bright Willamette Valley Pinot Gris. Crunchy, tangy, spicy and packed with flavor. If this is eating right, we’ll take more! With a renewed focus on taking good care of ourselves, we’ve been analyzing our fruit and vegetable intake. It is recommended by the Center of Disease Control and Prevention that adults our age consume two to three cups of vegetables a day. Our daily intake was not making the cut. We love flavor. We were not about to sit in front of cups of raw vegetables mindlessly eating in order to make the numbers. So we worked up a flavor-packed dressing and had a hard time putting the fork down. Whisk together honey, oils, vinegar, soy sauce, almond butter, salt, hot sauce, ginger, garlic and spicy garlic sauce to make dressing. Pour dressing over chopped vegetables. Toss. Serve slaw garnished with sliced almonds or other nuts. This tangy and sweet salad dressing will encourage you to eat lots of healthy veggies. It’s working in our home. ‘Tis the season to begin replacing the overload of holiday sweets with heathful fruits and vegetables. I can’t say all the sweets are gone, but Jack and I are certainly shifting the balance away from the cookies and pastries. Ok, we admit it. Our diet was entirely too rich. It was only a matter of time before the decadent butter, hedonistic heavy cream, fabulously fatty fried chicken thighs and all the rest of it were going to get us. We’ve been pretty good about not going crazy with portions over the years, but we realize it’s time for a more realistic and healthful change. I’ve been researching recipes and recipe books which earn the description “healthy.” I’m not too excited about what I’m finding thus far. I was looking for gourmet recipes which meet my standards and also will pass our would-you-be-happy-if-you-got-this-in-a-restaurant test. So, it looks like I have a new quest – the showcasing and creation of healthful gourmet recipes. Sounds like fun to me! We love salads – especially those big, fill-a-dinner-plate mixes crowded with a variety of color and lots of tasty ingredients. This salad dressing recipe is not fat free, salt free or taste free. It was borne out the desire to use apple cider vinegar as opposed to my favorite, balsamic vinegar. Quality balsamic is expensive and elusive in Ulaanbaatar. Apple cider vinegar is abundant. I mixed onion, freshly cracked pepper and a pinch of salt into the standard oil and vinegar dressing ratio. I then added Dijon mustard to emulsify the dressing and mixed in honey to balance the acid in the vinegar. Voila, a delicious dressing. Tonight it is going on a layered salad stacked with romaine lettuce, carrots, tomatoes, English cucumbers, and spring squash. It’s topped with Jack’s roasted skinless chicken thighs, pine nuts, sun dried tomatoes and a few flavorful shaves of parmesan cheese. Served with a mellow glass of wine and a slice of French bread, and we have ourselves a heart-healthy meal that passes the would-you-be-happy-if-you-got-this-in-a-restaurant test. Put all ingredients in a jar with a tight fitting lid. Shake vigorously. Store unused dressing in a glass container with a tight fitting lid in the refrigerator. Sweet and sour, savory custard-like dressing sets this potato salad apart from the traditional. Summer celebrations, potluck gatherings and warm weather inspire me to prepare delicious cold salads so we’re ready for anything. We enjoyed our roasted potato and caramelized onion salad so much, we wanted to try another potato salad. I thumbed through a 30-year old cookbook a friend gave me from her toss-before-I-move pile. It was one of those community collection recipe books. Many of the recipes were tried and true, but not particularly inspired. But in between a lima bean salad and a recipe for marinating mushrooms, there was a Pennsylvania German potato salad that sounded delicious. Seeing how Jack is the expert on all things Pennsylvania (compared to me, anyway), I asked him if he ever had this salad. He remembered many summertime meals featuring this style of potato salad when he was growing up in Pennsylvania. Inspired by Janet Jokinen, author of the original recipe, I set out to create my own version of Pennsylvania German potato salad. I cut the sugar and upped the flavors by adding German-style stone-ground mustard, seasonings, and, of course, bacon. My favorite thing about the salad is the dressing. Cooking the egg-based dressing in a double boiler produces a rich, savory custard. We made a double batch of the dressing to keep in the refrigerator in anticipation of future potato salad cravings. Bring water to a simmer in bottom of double boiler. Mix dressing ingredients in top of double boiler. Stir dressing continuously over simmering water until thickened. Dressing will coat back of wooden spoon when done. 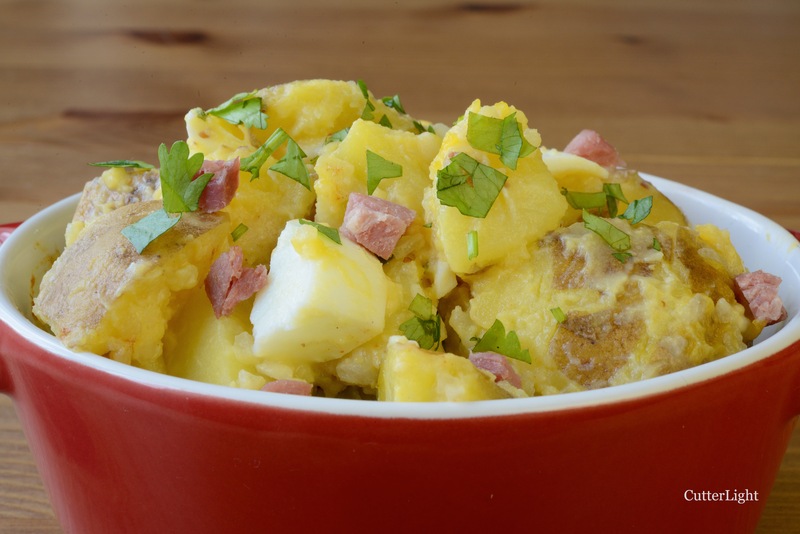 In a large bowl, combine potatoes, celery, diced eggs, chives, and bacon. Toss potato mixture with dressing. Garnish with smoked paprika and chopped parsley. 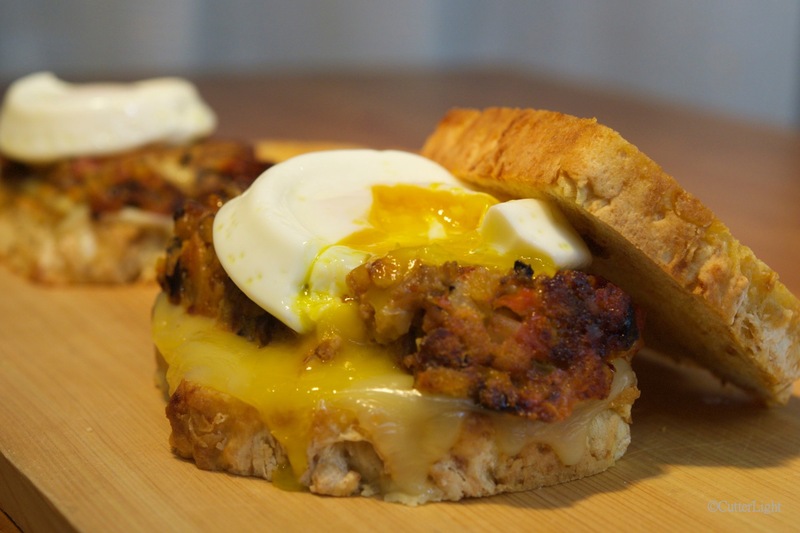 Smokey Chipotle Meatloaf with Poached Egg on Pan-Fried Beer Bread: Now That’s a Meatloaf Sandwich! My grandmother made meatloaf. My mother made the same meatloaf. Ground beef, an egg or two, breadcrumbs, milk, a dash of salt, a few grinds of pepper. Put it in a loaf pan, top it with ketchup, bake it, slice it, serve it with mashed potatoes. Not as tasty as a grilled hamburger… In fact, those meatloaf recipes of the past weren’t as good as a lot of things, and so for many of us this traditional dish has fallen by the wayside. Time to look at meatloaf in a new way. Think of the following recipe as a foundation to come up with your own twist on this iconic American comfort food. We served slices of the finished meatloaf on pan-toasted beer bread, one side of which was covered with melted gouda cheese. The poached egg on top – not an idea original to us – was perfect. After five miles of hiking through the city of Ulaanbaatar on a sunny, sub-freezing day in Mongolia, we had little difficulty polishing off these hot, hearty sandwiches. Grease a 9″ x 5″ loaf pan with butter. You will need a sheet of aluminum foil to cover this pan. Set oven rack to center position and preheat oven to 350 degrees F (175 C). In a pan over medium heat, fry bacon until thoroughly cooked but not crisp. Remove bacon and set aside. Save bacon grease in pan. Over medium heat, add olive oil to bacon grease. Add diced onions and cook for about 1 minute, stirring occasionally. Add diced bell peppers and continue cooking and stirring occasionally till onions turn translucent and bell peppers are soft. Remove onions and bell peppers from pan and set aside to cool. Place egg in a large bowl. Add soy sauce, Worcestershire sauce, powdered chipotle, paprika, oregano, salt and black pepper. Whisk together. To the egg mixture, add all remaining ingredients except the barbecue sauce. Gently fold everything together with your hands. Keep in mind that while you do want everything evenly mixed together, the less you handle the ground beef, the better the texture of your baked loaf will be. Place meat mixture in greased loaf pan, pressing down as you would a hamburger. Slightly indenting the center will result in a finished loaf with a more even top, as the center will rise when baking. Top the loaf with chipotle barbecue sauce, cover pan with aluminum foil and place in oven. Bake for 20 minutes. Remove foil and continue baking for 40 minutes. Remove loaf from oven. Let rest for 10 minutes. Gently flip the loaf out onto a serving platter. Melt a slice of gouda cheese on pan-fried toast made from rustic bread. Place a slice of meatloaf on the toast with the cheese, slather the other slice of toast with additional chipotle barbecue sauce, place a poached or easy-over egg atop the meatloaf and dig in. water, as necessary, to achieve desired consistency. The sauce should be fairly thick. Combine ingredients in a pot. Simmer over low heat for about 10 minutes, stirring frequently. Place about 1 tbsp of good olive oil in a frying pan for each slice of bread to be toasted. Over medium heat, bring oil to a soft sizzle. Reduce heat to medium-low and place the bread slices in the pan and fry for about 2 minutes on each side, until surface is golden and crispy. For an extra kick of garlic, coat one side of each slice with olive oil and top with minced garlic. Take care not to burn the garlic. This is a family favorite. Bacon? Smoked salmon? Leaks? Mushrooms? Smoked cheese? Pick your ingredients and bake them into this deliciously fluffy frittata. We love our weekends – time to cook a special breakfast or brunch and linger over it with a second cup of coffee and a good book of poetry. Adaptable to a wide range of ingredients, frittatas are among our favorite weekend breakfasts. One key to turning out a great frittata is to use the right pan. We’ve been using Swiss Diamond nonstick cookware for years and are big fans. Sunny-side up, scrambled, or easy over, eggs slow-cooked over low heat in these pans are a revelation. And although the word frittata has its etymological roots in the Italian friggere, which means “fried,” we usually bake ours. Sautéing vegetables before they go into the egg mixture brings out their sweetness, drives off excess moisture and allows for a richer balance of flavors. And the key to a super fluffy frittata? Separate out the yolks and whip the whites into fluffy peaks, then fold them into whatever mixture of egg yolks, cheese, meat and vegetables you’ve prepared. Here’s how we made ours this morning. 8″ nonstick, oven-safe frying pan with lid. Swiss Diamond pans have heavy bottoms and non-stick cooking surfaces that are perfect for this, and they’re oven safe. 1/2 teaspoon ground chili pepper, separated into equal portions. We used Penzeys Southwest Seasoning which is a blend of sweet ancho, oregano, cayenne pepper, cumin, chipotle pepper and cilantro. Cut bacon into small pieces. In a medium-sized pan, fry over medium heat till edges are crisp. Drain on paper towels. Wipe excess bacon grease from pan. Add butter and olive oil. Heat over medium till just sizzling. Add onions and sauté for two minutes, stirring occasionally. Add white wine, bell peppers, sea salt, black pepper and ground pepper, stirring occasionally. If necessary, turn heat up slightly to drive off excess liquid. Cook till onions turn translucent. Remove from heat and transfer to a bowl to cool slightly (so that when added to the egg yolks, they don’t cook them). Separate egg yolks and whites into two sufficiently large bowls. Use a blender or whisk attachment to whip egg whites to fluffy peaks. Set aside. To the egg yolks, add vegetables, bacon, shredded cheese, remaining ground pepper, and additional salt and black pepper to taste. Mix thoroughly. Add olive oil to 8″ frying pan. Pour mixture into pan. Cover with lid and place into preheated oven. Check in 15 minutes. Expect total cooking time to be about 25 minutes. 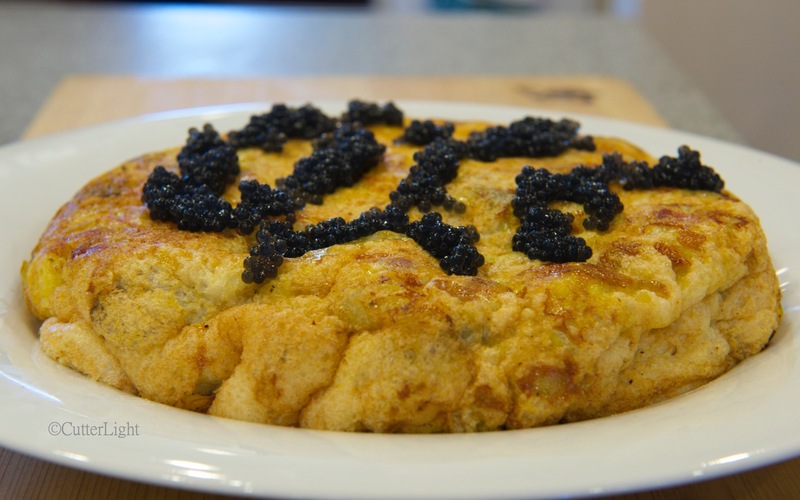 Garnish with caviar and serve hot. We enjoyed our frittata with sautéed mushroom caps, summer squash, big mugs of coffee and Czeslaw Misosz’s poetry anthology, A Book of Luminous Things.